Originally from China, Fangfei chose Monash based on its high reputation as a global university. 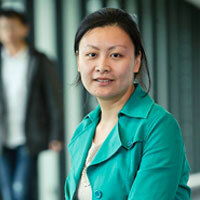 Due to domestic competition, she decided to renew her information technology knowledge to further her career aspirations. Generally, people in Melbourne are kind. You can often find people smile at you or talk to you very kindly. You do not worry about your language problems, because they always listen to you carefully until you finish talking, regardless of whatever your accent is or where you are from. It is a multicultural city full with a vibrant cultural atmosphere. There are many libraries, free museums you can visit and lots of international events you can attend such as the Melbourne International Film Festival and the Australian Open (tennis).